1. Pin the images below that you love to Pinterest and leave a comment when you do. The more you pin the more chances you have of being picked. 2. Go to the Doodlebug Facebook page and share either of today's posts with your friends. 3. We would love to know where our fans all live, so leave a comment and tell us where you are and what the weather's like. You will have until Saturday, March 15th at 12:00 noon MST to enter. We'll post the winner on Sunday, 3/16. Now scroll down and check out these amazing Kraft in Color card projects by Amanda and Courtney!! If you are like me, you love having a large assortment of paper in all kinds of colors and patterns. 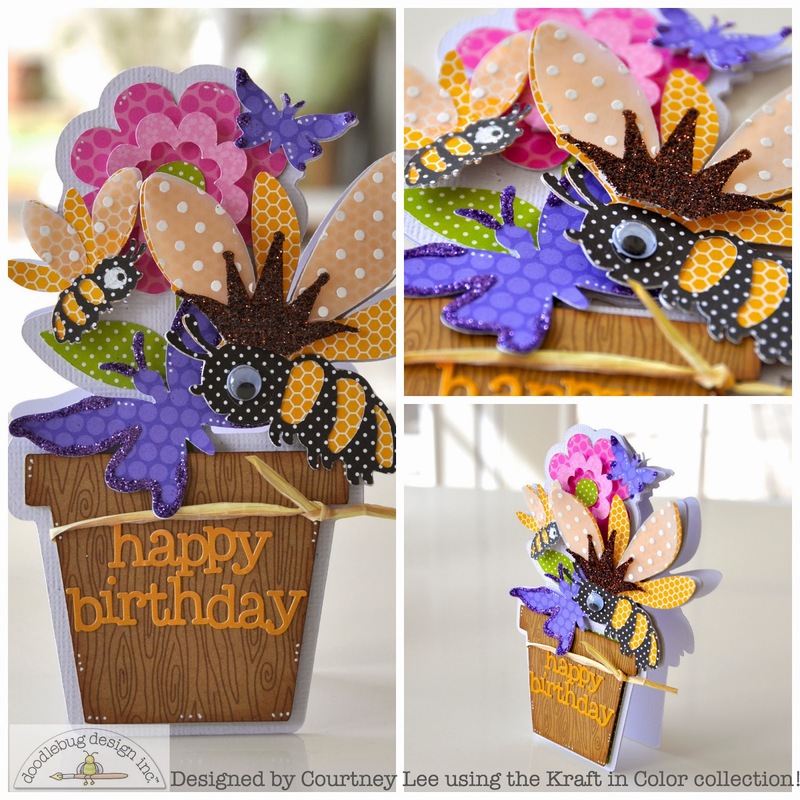 Doodlebug's new Kraft in Color has just that. Each classic Doodlebug color is paired with both kraft and white and comes in several shades and patterns. I mixed and matched patterns and embellishments to create a couple of bright and fun monochromatic cards. Both of these cards were created using journaling cards from the Kraft in Color collection. 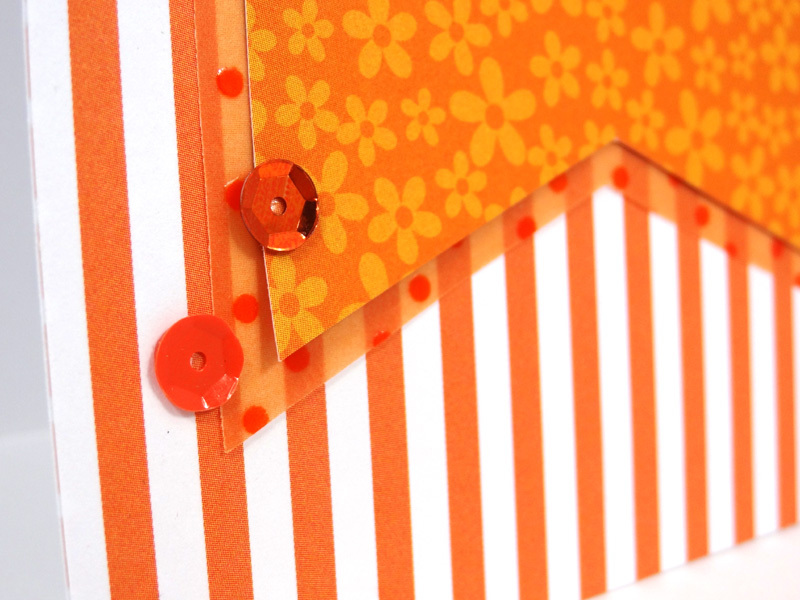 I trimmed this orange journaling card into a banner shape and made it the focus of the card. Each container of sequins has 6 different colors and three different finishes. These sequins are a metallic, pearlescent and opaque. Aren't they lovely? More colorful sequins and a swiss dot vellum overlay. Doodlebug's swiss dot vellum comes in all colors of the rainbow. It is seriously awesome stuff! 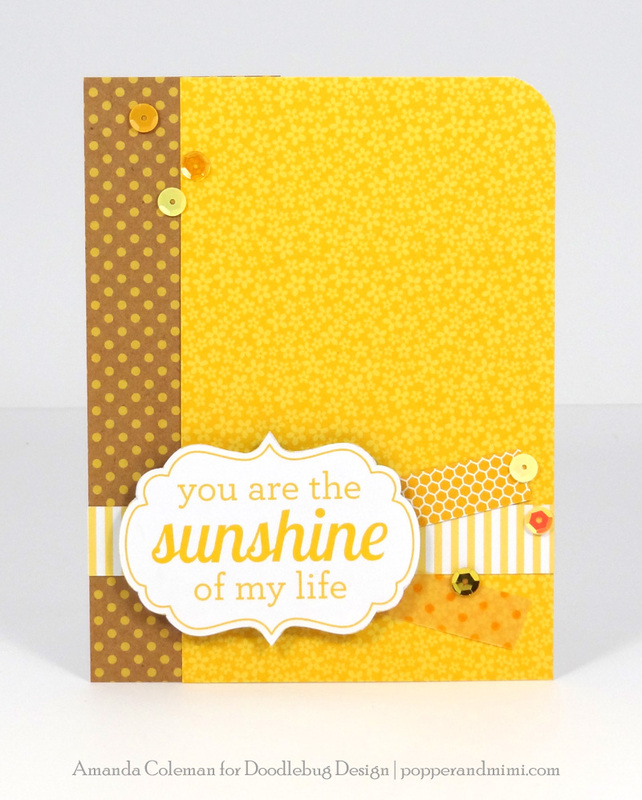 I fussy cut the sentiment from a journaling card and paired it with a bunch of different yellow prints and patterns. This is a happy card, indeed! More colorful sequins and swiss dot vellum. I love the various shades of yellow in the Kraft in Color collection. The yellow polka dots on kraft is my favorite Kraft in Color pattern. 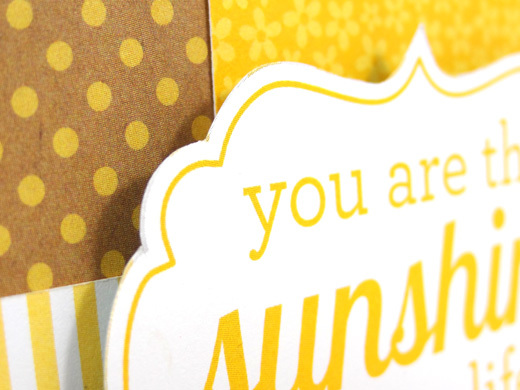 The yellow dots look stunning against a kraft background. Good day to you! This is Courtney from Court's Crafts here with a very springy birthday shaped card! The new Kraft in Color collection.... what can I say... I. LOVE. IT! The patterns are awesome. The colors are perfect. There is neither too much white nor just one pattern (like polka dots). There is so much variability. If I could tell any crafter - especially beginners - to buy just one (well two) collections it would be Kraft in Color - Color and Kraft in Color - Kraft. Both collections are equally amazing. Get both! Trust me! I used both 6x6 pads to create this card. 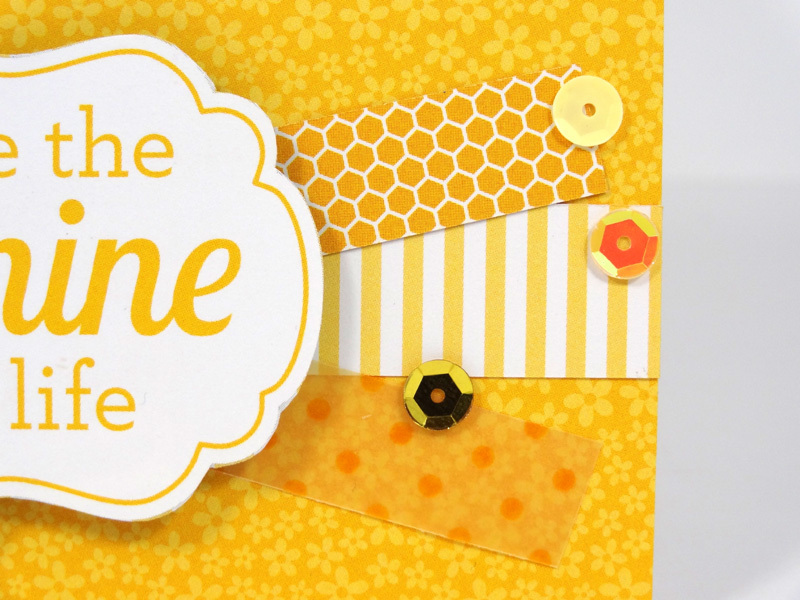 There are 7 patterned papers on this card along with sprinkled vellum for the bee wings. I wanted to add some sparkle so I used some liquid glue around the edges of the butterflies and ran the crown through my Xyron sticker maker and glittered away! I used a lot of dimension on this card and had a great time with it! 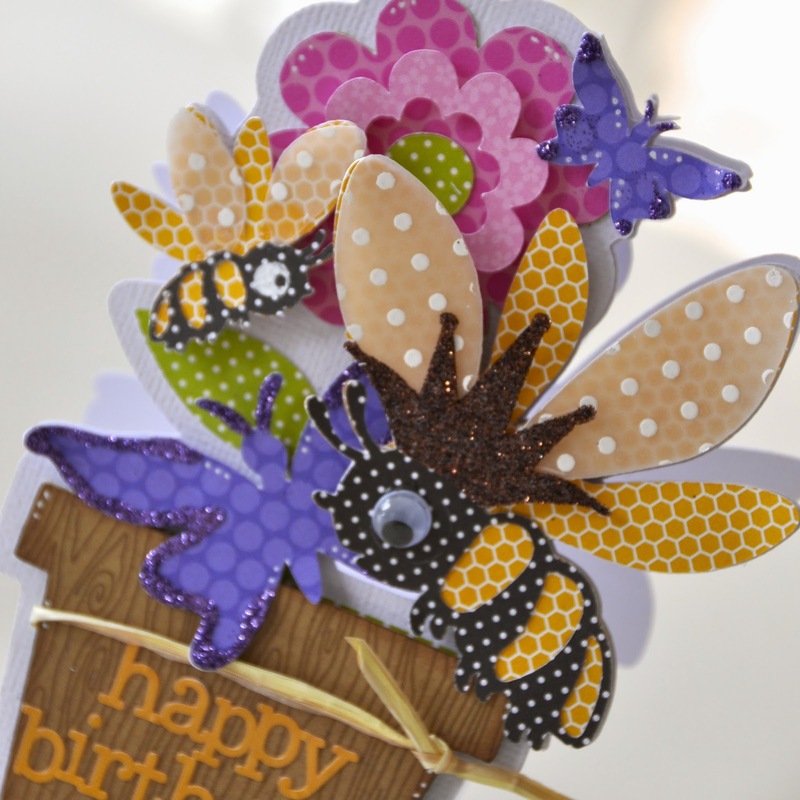 The sprinkles vellum is popped up on the big bee to give it a fun wing effect. I finished it off with a happy birthday sticker that conveniently matched the bee wings. I LOVE how doodlebug cares so much about coordinating colors across collections! Thanks for taking a peek at my project and I hope you have a beautiful day! These cards are gorgeous! I'm in Alabama the weather is crazy right nor 70's one day 50's the next! The trees are blooming and the daffodils are out! Pinned to my boards, I'm in Chicago, we've had a rough winter this year, we've got a warmer day today though, hope it continues, I so badly need some Spring cheer!! Pinned to my Homemade Cards Board - Love your Collections!!!! Today it is supposed to be mid 50's and tomorrow night we are expecting 3 1/2 inches of snow!!!! I'm in Finland and the weather is sunny and very windy, +7 degrees Celcius. Love Kraft in Color! I live just outside of Houston, TX, and the weather here is sunny and gorgeous - in the 60's - so ready for Spring Break! great cards, simple and clean and a really great detailed one too! I live in WI and it is cold and wet here! So I could really use something to cheer me up, I hope I get chosen for the giveaway!!! Thanks for sharing these ideas. 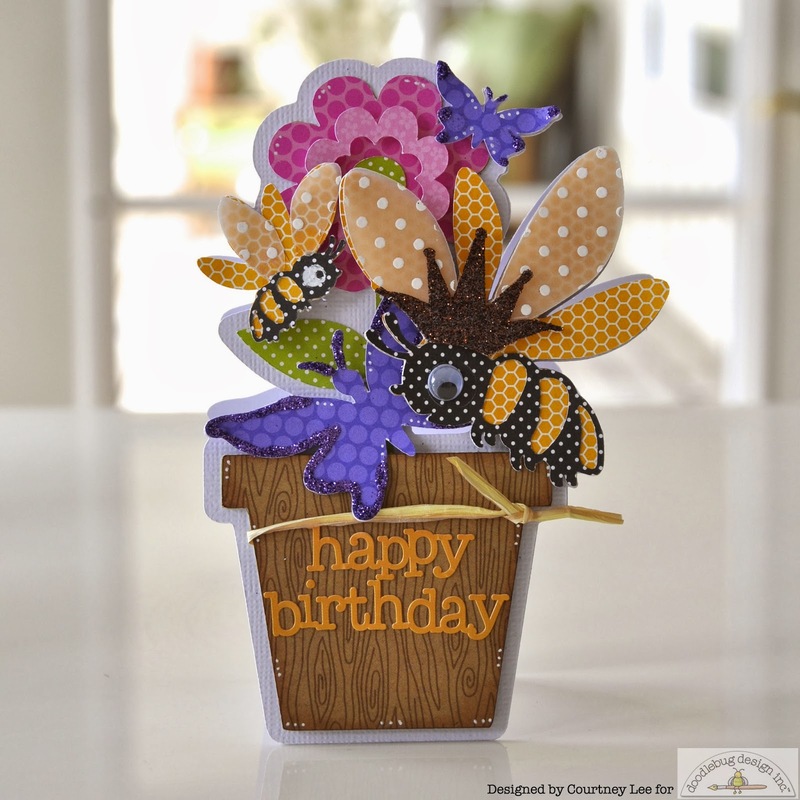 pinned the awesome flower pot card. Loving the bee! Pretty projects! I pinned all three cards to my Pinterest account (Amy Cooley). Thanks for the fun giveaway! Love the orange card. Fun banner design. pinned the fun layout from a couple of days ago. I love the blocks of color. fabulous mini album. The paper is perfect for building a fun yet easy background. Very awesome!! I love these creations. Just beautiful. Just in time for spring! I live in Wisconsin and its beautiful, sunny and about 35. (That above zero!!!!!!) Yipee! Hello! I'm from Canton, Ohio.......from temps in the single digits 2 days ago we are headed for 55 degrees today! Woo Hoo - it's a sunny morning, and I can hear the birds singing! Have always been a fan of Doodlebug products - love your new collections this spring, and can't wait to get my hands on them! That bee card is adorable!!! I'm in northwest North Carolina, where it's bright and sunshiny but a bit cool. Always love Doodlebug projects...cute and colorful! I have pinned all three adorable cards to Pinterest! I am in sunny Southern California--the high today is 75 degrees! I also pinned the beautiful yellow one under privett25. I love the bumblebee card. The 3d effect makes it look so cute! I pinned under privett25. In El Dorado Arkansas, cloudy. I live just outside Atlanta, GA. Today is a beautiful day, a little on the chilly side, but still beautiful. Share two of your FB posts on my timeline. I am from Orem, UT not too far from where the awesome Doodlebug Design company is!!!! I'm in Sussex, UK, where it is sunny and dry but a little chilly! I'm in Oahu and the weather is a nice 66 degrees! But it's a little muggy and hot. Beautiful cards, the monochromatic theme looks fabulous! I'm sunny California and it is a gorgeous 70 degrees! I shared on FB and am pinning away, would love to win this collection for my birthday later this month! Happy color cards - they bring spring closer) Pinned the yellow one. I'm in Moscow (Russia) and it's lovely here - mostly sunny with a bit of drizzle today. I shared your post on Facebook and in Sounthern Missouri we are overcast but not too cold! Hi from Toronto, Canada! This week, we went from sun and 52 F, to a blizzard and -24 windchill the next day. Now we have sun again and 46. Crazy winter this year! Seriously fantastic cards! Im located in Sydney Australia and hoping for a sunny day. Weather has been crazy here lately, complete sunshine to thunderstorms and back again. Shared the facebook link with my friends. Actually decide to share both the facebook links. Great stuff guys! I love everything that you do!!! I have pinned the cards, which are beautiful! Thanks for the opportunity. I love Doodlebug!!!! Is everything a die cut? I love this! I'm from Michigan and we just had another storm so we have about 8" of snow on the ground. But, the sun was out today and it hit 45* so it was a beautiful day! I pinned all of the projects. These are adorable cards! All of them! I'm in Idaho where the weather is cloudy with a chance of sun! Northern NY and just had another whopper of a snow storm. I am so over this winter, i live in the north and i can't wait for spring. pinned it, love this card. Wow, I love the tangerine colored card so much! Pinned and left comments. I live in California and it is warm and sunny today!! yay! Delightful cards! I love Doodlebug's fun and cheery patterns and colors! I am in northern CA where we had a beautiful spring day! It's been in the low 70's. I have loved Doodlebugs merchandise for YEARS!! I am in Dallas, TX and the weather is trying to move into a spring pattern, but we can't seem to shake a cool day or two weekly!! Like a temperature rollercoaster!! I am in Idaho and we had a little bit of everything today....except snow!! Yay!! We had sunshine, wind, rain, thunder, and hail and chilly temps. Spring with its unsettled weather is here.....Yippee!!! LOVE this Kraft in color. The cards are wonderful!!! Thanks for the chance to win!!! I pinned all three cards. I especially love the Bumblebee card. It's amazing! Thanks for the inspiration. I'm soooooo ready for spring!!!!!! pinned all 3 - what great cards. In Anchorage, Alaska we just got a foot and a half of fresh new snow!! Adorable! Here in the Chicago area we need bright, happy cards! The weather here can't make up it's mind if it is winter or spring. Thanks for brightening my day. Pinned to my Cards board. It is warm and humid in San Antonio today. Bluebonnets and mountain laurel are a sure sign of springtime in central Texas. 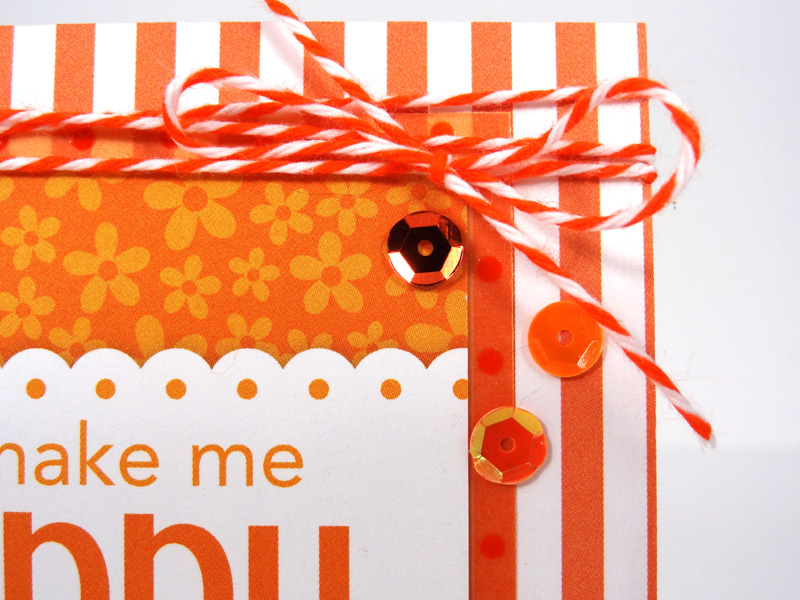 I pinned the orange card - love Kraft in Colour and the monochromatic colour scheme! I live in Saskatchewan, Canada ... we've had a long and especially cold winter, so it's nice that warmer temperatures are here - it's a bit cooler and overcast today, but the last few days have been sunny, warm (around 0 degrees C), and it's melting!!! 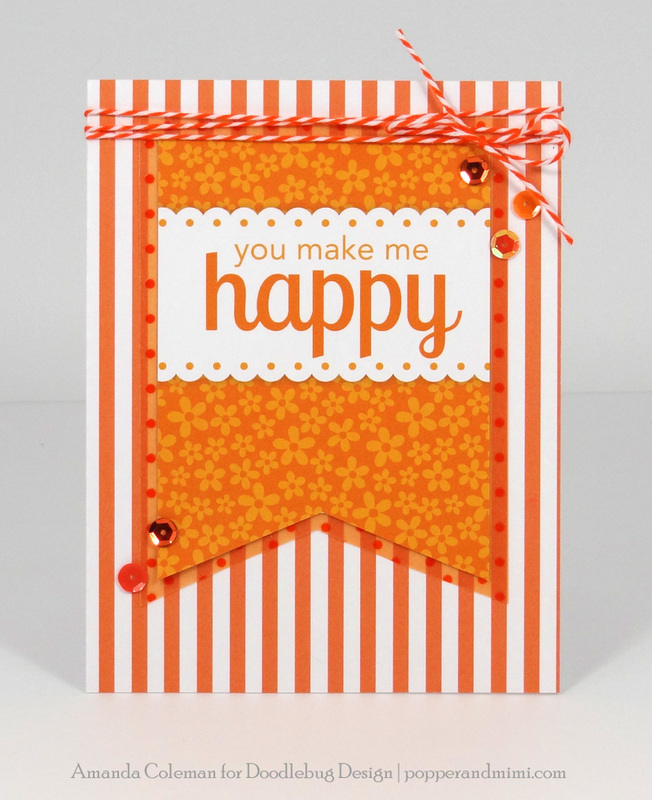 I pinned the orange card - LOVE it! I'm in Missouri and our weather has been bouncing back and forth between winter and spring. Love all the bright and happy cards. Sooo cute, that bee one, I loved the most.. pinned it in like 4 or 5 catagories on my pin board. Thanks! L.r. Smith on fb!!! LOVE the bright & cheery Kraft In Color AND the fabulous projects shared!!! I'm checking in from Down Under - Chelsea, Victoria, Australia :) We're 2 weeks into Autumn, things have been pretty hot here until some storms passed through last night, so we had a lovely mild day today, with a top of 20oC (68oF) and a few showers ... cannot imagine what is has been like for everyone suffering endless snow and the Polar Vortex!!! I pinned all three! Love those monochromatic ones from Amanda especially! She definitely has a way with clean, simple, and STUNNING! I am coming to you from Illinois! Just coming back to share that I pinned and pinned and pinned, love my Doodlebug Board! Thanks so much for all of the inspiration.